Product #45876 | SKU HO-PHD40.5 | 0.0 (no ratings yet) Thanks for your rating! 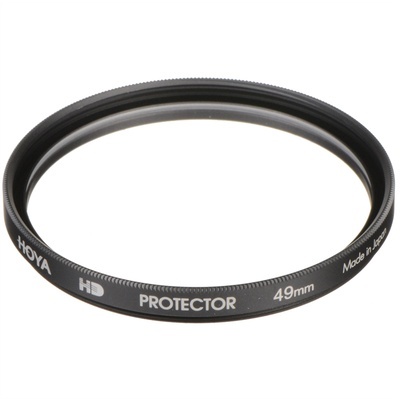 The Hoya 40.5mm HD Protector Filter is a simple, clear filter with a 1x filter factor and is designed to provide general protection for your lens. This optically clear filter does not affect overall image quality while helping to prevent dust, scratches, moisture, and other substances from reaching or damaging your lens's front element. To prevent internal ghosting and reflections, eight layers of anti-reflection coatings are applied to each side. This total of 16 coatings offers a high degree of protection to the filter substrate and helps it to stay clean for longer than uncoated filters. The coating formula associated with HD Protector filters also promotes effective cleaning with regard to water, oil, and stains. Constructed from chemically-hardened optical glass, the Hoya 40.5mm HD Protector Filter's resistance to scratches is enhanced while providing clarity and colour fidelity. It also features a thin, lightweight, aluminium-alloy filter ring to minimise the potential for vignetting. Clear filter offers general protection for your lens. Eight-layers of multi-coating on each side to prevent internal ghosting and reflections. Multi-coatings promote effective cleaning with regard to water, oil, and stains. Creates no additional colouration or contrast. Thin, lightweight aluminium-alloy filter ring helps to prevent vignetting. Knurled front edges provide a more textured grip when mounting or removing it from a lens. 40.5mm front filter threads allow for use with other filters. Box Dimensions (LxWxH) 3.5 x 2.8 x 0.5"